The Women’s DVD presents all of the classes of the WOMEN’S FIGURE – INCLUDING NOVICE & MASTERS, FITNESS, PHYSIQUE, & ALL BIKINI FITNESS CLASSES. Plus the ARNOLD AUSTRALIA MODEL SEARCH. See all of the lineups, key comparisons and callouts and all awards, plus the WOMEN’S BIKINI FITNESS OVERALL won by JADE McKEE of Australia and FIGURE OVERALL won by YVETTE BROWN of Australia. Pro Cards also went to Nicky Foord in WOMEN’S PHYSIQUE and Christine Ray in FITNESS, both from Australia making 4 Pro cards in total. This Women’s DVD presents all of the classes of the WOMEN’S FIGURE – NOVICE & MASTERS, FITNESS, PHYSIQUE, and ALL BIKINI FITNESS CLASSES. 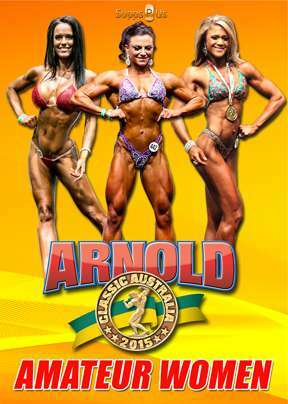 The ARNOLD AUSTRALIA MODEL SEARCH is also included. See all of the lineups, key comparisons and callouts and all awards, as well as the WOMEN’S BIKINI FITNESS OVERALL won by JADE McKEE of Australia. The FIGURE OVERALL was won by YVETTE BROWN, also of Australia. Pro Cards went to Australians Nicky Foord in WOMEN’S PHYSIQUE and Christine Ray in FITNESS making 4 Pro cards awarded in total.